Squirrels, usually fat ones, are all over UCLA, but you don't always see squirrels interacting with other squirrels, and you don't always see students helping out the fuzzy creatures. That doesn't seem to be the case with this squirrel duo who worked together with students getting up a high ledge on BruinWalk, though! We have to agree with the description here: "not my video, but exceedingly uplifting :)". Well said, YouTuber, well said. As you can see, the baby squirrel—for some unknown reason known only to itself—wants to get up the high wall but cannot make the jump. Despite squirrels' overall propensity for leaping, it can't quite get there (probably because it's so engorged on BCafe, Rendezvous, and Cafe 1919 leftovers). Luckily, a bigger squirrel, who has no trouble getting up the wall, was there with it! It tried to help (moreso by some sort of squirrel communication, it seems), but it was physically unable to do so. However, students watching the ordeal decided to take action! Backpacks and other items started to be piled up to assist the baby squirrel up. Surprisingly, the squirrel seemed to not be afraid of the new items and actually used its newly found ladder! 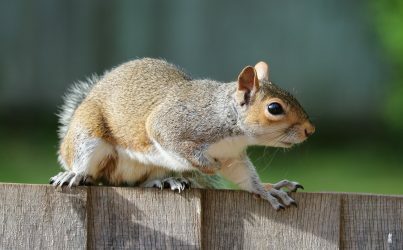 What a truly incredible story that breaks down the barrier between humans and squirrels! It brings a tear to our eye. It's pretty amazing what the power of teamwork can do! Truly an inspirational feat.